The race profile and sections was released this morning at 10:05 to team captains, in a short meeting at the hotel Rey Don Felipe. This early release, before the maps are given at the race briefing tonight at 20:00, is a different procedure from previous editions. The race director took this decision to alleviate some of the stress of race preparations and to allow teams more time to plan the sections, before the maps are given. Another notable change is that there will be no skills testing for kayak and ropes during the gear checks taking place today, Sunday November 18th. The reasoning behind this choice is that teams have already provided the skills certificates and it is their responsibility to have the capacity to use those skills. This change appears to be greatly appreciated by the teams, with Jason Magness of team Bend Racing/YogaSlckers, thanking the RD after the opening ceremony last night for not making them roll their kayaks in the chilly waters of the Magellan Strait. Although both measures ease some of the stress on teams, an error in the English version of the pre-race schedule added a bit on. The time for the first captain’s meeting was given as 08:30 but the actual meeting time was 10:00. Several team captains were waiting in the lobby of the hotel Rey Don Felipe, with East Wind’s team members arriving first, at 08:10. Rafal Nowakowski, team captain of Spirit of Poland, was not pleased and asked for the rest of the day’s schedule to take into account the error but it was not possible to change the planning. Notably absent from the captain’s meeting was Masato Tanaka of the Japanese team East Wind. His teammate told the gathering that his captain was still in Santiago, trying to get their bike boxes through customs and was expected to return on a late night flight, arriving in Punta Arenas around 02:00! Upon hearing this, another captain muttered, “nightmare.” Nightmare indeed, walking into the opening ceremony last night, Yasuhiro Takahama said that he was already exhausted before racing had even started, due to the gear issues. The meeting was brief, from 10:05 to 10:15 and the race director specified that no questions would be answered; they were to be asked at the race briefing at 20:00. After the race profile was distributed, Urtzi from Columbia Vidaraid asked a question in Spanish and the RD insisted-no questions. The atmosphere was concentrated and tense in the room of all male team captains. The above numbers may look positively tame to seasoned expedition racers but factor in the notorious Patagonian winds, the peat [turba), and inhospitable landscapes and you’ve got the recipe for a massive expedition. 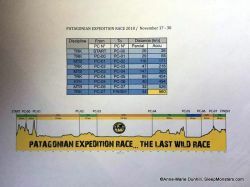 As SleepMonsters wrote in an earlier article, the first section is expected to be the most technical trekking of the race. The race director elaborated on this information, saying that they are currently monitoring the weather as the forecast is not favourable at the moment. He projected a picture taken two weeks ago on this first section (showing mountains and heavy snow accumulation) and explained that there could still be anywhere from 8-10 meters of snow in parts of this first section, dependant upon how much has melted, and it is the only one in which full mountaineering gear is part of the mandatory equipment. The first CP, OO, is the only one that will be unmanned, with only a kite to punch. The race is concerned about slower teams arriving at this point on the first night of racing, if the weather is unfavourable. The RD compared the potential bad weather conditions on the first night to being in the Himalayas so a decision will be taken at 05:00 as to when the race actually starts, contingent on this forecast. As if to highlight his point, a strong gust of wind rattled the doors and windows of the room in which the race briefing was taking place. It is important to note that the 13th edition of PER is taking place in November instead of the month of February when the race is traditionally held. November falls in the austral spring and teams can expect longer days but also colder weather. The meeting ended at 10:15 and the captains rushed off to join their respective teams for the gear checks taking place throughout the afternoon in the Complejo Gimnasio Fiscal.